Cornwall Canoes is one of the leading Hobie Kayaks dealers in the UK. 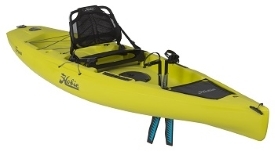 We stock an extensive range of Hobie Kayaks and Hobie Accessories. All our staff own and use Hobie Kayaks and know their craft inside and out. If you would like to discuss any aspect of the Hobie Kayak range then please contact us. 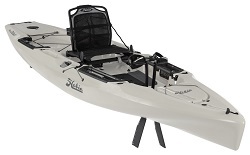 These models come with all of the essential Mirage Drive kayak features but in a simplified design at a great price point! The all-new Mirage Passport 10.5 brings a simplified design with the essential features at a low price point. Enjoy all the benefits of Mirage Drive pedal power in a compact and affordable package. The Mirage Compass combines aspects from the Revolution and Pro Angler hull designs, with a simplifed deck outfitting for great performance at a great price. Great for touring and kayak fishing! These models come equipped with extra features and the latest Mirage Drive 180 and Vantage CT seating system for the best pedal drive experience. 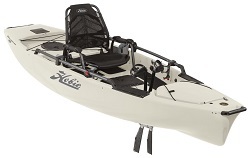 Hobie's most popular single seater Hobie Kayak in the Mirage series. The Revolution or "Revo 13 " was designed to be versatile yet effective. A popular choice for those who want to go touring and exploring and is also great for kayak fishing! The fastest solo kayak in the Mirage Drive range. 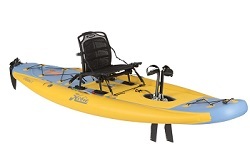 The Revo 16 is designed for distance touring and kayak fishing. The long sleek hull is at home in rougher sea conditions as well as calmer waters. The Hobie Revolution 16 takes over from the previous Hobie Adventure model. Hobies brand new Revo 11 combines all the great features of Hobies top selling single seater Revolution 13 in a more manoeuverable lighter weight kayak. The smallest kayak in the Mirage range. The Sport was designed for children, teenagers and smaller adults, or for somebody who is looking for a light-weight pedaling kayak. The popular Compass is now available in a tandem option, equipped with two Mirage Drive GT's and two Vantage Seats. Featuring a stable hull design, large rear cargo area and H-Track accessory mounts. Great for couples and families for general fun, touring and fishing. 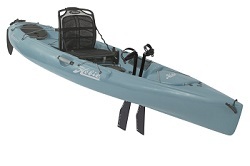 A sleek and fast tandem kayak featuring a Mirage Drive 180 system for both kayakers. Ideal for anglers, nature watchers and for touring and exploring inland and on the coast. The Pro Angler 12 is super stable platform designed specifically for fishing. An impressive list of features includes the all-new Mirage Drive 180, a super comfy Vantage ST seat, rod storage tubes, H-Rails and much more! Now also available in a limited edition Camo colour. The Hobie Mirage Pro Angler series combines a feature filled super-stable fishing platform with Hobies revolutionary Mirage Drive System. The larger version of the Pro Angler 12. The ultimate lake and calm water fishing kayak! Now also available in a limited edition Camo colour. A sailboat, kayak, trimaran and fishing boat! Unfurl the 6.04 m² sail and ride the wind, or use the Mirage Drive when the wind is absent. 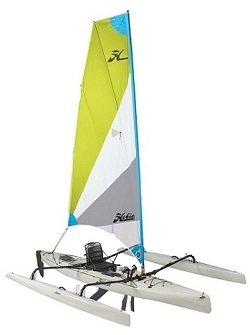 The fold-out AMAs provide superior stability and the daggerboard prevents lateral slip, making this a very capable and super fun sailing craft! Detach the AMAs and AKA bars and you have a pedal-drive touring and fishing kayak! The Tandem version of the popular Adventure Island. Sail it, Pedal it, Paddle it, Fish from it and more! The 18ft 6in Tandem Island with its 8.4 m² sail is the ultimate sailing kayak that is both easy-to-use and great fun for expedition touring, day tripping and fishing adventures. Hobie have yet again produced a revolutionary watercraft. This time its the world's first Stand Up Pedalboard! 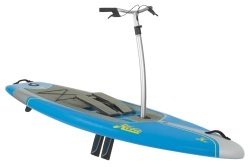 The Mirage Eclipse 10.5 combines a the fun of a SUP, the reassuring control of handlebars and the efficiency of the Mirage Drive system to produce a very versitle stand up board for play, touring and exercise. Hobie have yet again produced a revolutionary watercraft. This time its the world's first Stand Up Pedalboard! 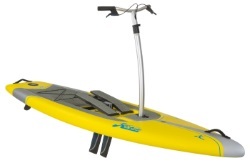 The Mirage Eclipse 12 combines a the fun of a SUP, the reassuring control of handlebars and the efficiency of the Mirage Drive system to produce a very versitle stand up board for play, touring and exercise. At 12ft this model is great for going that extra mile or two. Paddle, pedal or sail the Hobie inflatable kayak range with the revolutionary Mirage Drive System. Re-designed for 2016 and featuring the super comfortable Vantage seating system. All the fun of a Hobie Mirage Drive kayak that packs away in a convenient storage bag. 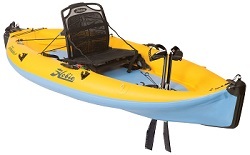 Inflatable kayak that features Hobie's Mirage drive system. Great for those with limited storage space. Includes the Vantage CT seating system for ultimate comfort and the new Mirage Drive 180 for forwards and reverse pedalling! An inflatable low profile kayak-board hybrid! Using high-pressure drop stitich technology and packed full of features including a Vantage CTi seating system and Mirage Drive 180. Inflatable kayak from Hobie featuring their MirageDrive system. Great for pedalling over longer distances for touring/exploring and kayak fishing. Perform well on inland waters and calm-to-moderate coastal conditions. Featuring the Vantage CTi seating system and the Mirage Drive 180. Tandem inflatable kayak from Hobie. Perfect for those with limited storage and transport space but still wanting a kayak with Hobie's Mirage Drive System. Great for couples and families! Hobie Mirage kayaks are propelled through the water using the incredibly efficient Mirage Drive pedal system. You pedal by stepping alternately left and right, not unlike an exercise stepper, to drive two rubber fins beneath the hull. They work much like a penguin's fins to propel the Hobie Kayak forwards with surprising speed and ease. All of which lets you go into kayaking feet first, with your hands free for fishing, photography and more! The Mirage Drive has been continually developed over the years and the latest Mirage Drive 180 even allows you to reverse at the simple pull of a toggle on the drive! 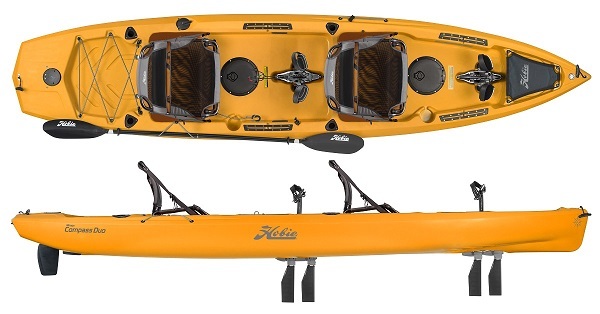 Hobie Kayaks come loaded with features including a super comfortable Vantage seat, a retractable rudder system, storage hatches, paddle and much more!